A healthy, white smile is easier and less expensive to achieve than you might expect. Daily habits combined with the whitening agent of your choice can keep your teeth looking strong and bright. Here are some Teeth Whitening basics from your Vancouver family dentist: Dr. Dale Nelson. If your teeth have lost their luster, it may be time to whiten them. Teeth whitening is basically applying a bleaching agent to the surfaces of your teeth. The best equation for whiter teeth is consistent use over a long period of time to produce the results you want. If you want to spend less than $100, there are many teeth whitening agents available in retail stores. These options range from strips that adhere to your teeth as well as non-customized mouth trays filled with a bleaching agent. These teeth whiteners are safe to use at home and don’t require a dentist’s supervision. They also require more consistent use and a longer amount of time to work. To get the most from these less expensive options, follow the directions carefully. Teeth whitening that’s done by your Dr. Nelson at Salmon Creek Family Dental is the fastest, easiest and most convenient way to whiten your teeth. Using professional equipment, Dr. Nelson can help whiten your teeth up to ten shades in about an hour. While more expensive, this is the most effective way to whiten teeth. 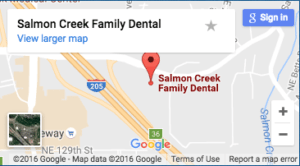 A less expensive option involves customized mouth trays and the supervision of Dr. Nelson and his staff at Salmon Creek Family Dental. In a little over a week, your teeth could be up to ten shades whiter using these materials provided by Dr. Nelson. Many dental professionals offer these teeth-whitening kits for free for new patients, which may be worth your time and effort.